Are you frustrated when you can’t find the exact pattern design you can see so clearly in your mind? So am I! And for years, I have solved the problem by ‘glomming’ pattern pieces and putting them together into a totally new design. Never would I admit this nefarious practice–until now. 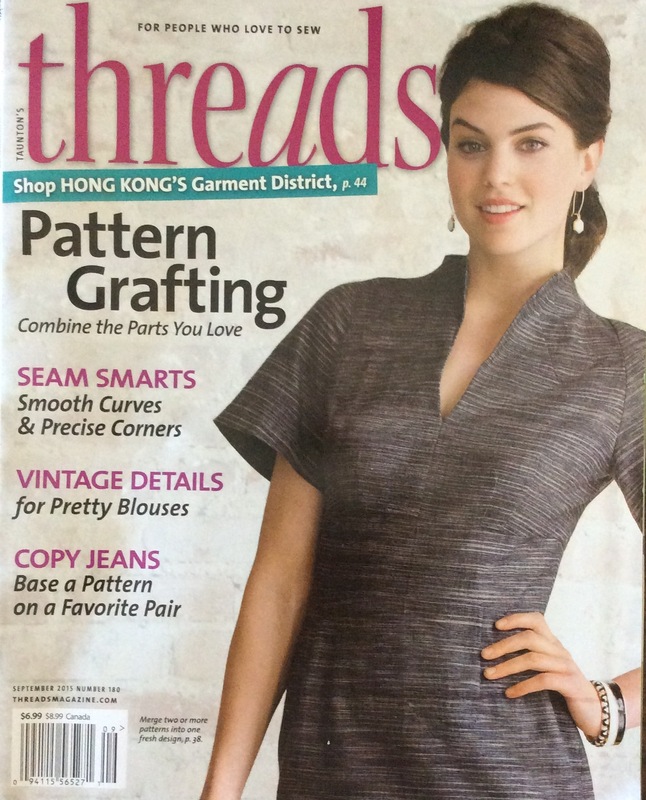 The cover of the September 2015 issue of Threads Magazine features Pattern Grafting, Combine the Parts You Love. Grafting–an elegant, affirmative term for my covert actions. And, if Threads devotes pages to the practice, that is the ultimate approval. Whew! I am coming out! There, I feel better. Unless you are a computer expert, hacker is an inferior, second-class person. But as we all know, practice makes perfect. Therefore, I declare a Pattern Hacker someone proficient at combining patterns, especially a hobbyist. Frankly, I’m too lazy. And, I can’t draw! I used to cut and paste magazine photos into a composite of my fashion ideas. I still tear pages and keep in an Idea File but constant practice has refined my mental process so I can ‘see’ a garment in my mind’s eye. One advantage of life experience, is learning/knowing one’s strengths and weaknesses. My skill is in combining/arranging pattern parts. I still start with an idea that usually exists only in my mind. Anyway, why should I reinvent the wheel? I have tons of patterns that just need a bit of tweaking; it’s much quicker and more fun pawing through patterns–especially in the middle of the night when you can’t sleep. That’s the best time to review your patterns as all of a sudden, something clicks and then you’re in the stash pulling out potential fabrics and before you know it, you have your next sewing project(s). I know many of you are fabric hackers as I see your results on FaceBook sewing sites, and your blogs. You can visualize combining, mixing and matching fabric and trims so the finished garment looks nothing like pattern envelope design. I say, Way to Go Gurl! When I worked on the Singer Sewing Reference Library books, I was surprised to learn that not everyone has visualizing ability. Case in point was the Creative Director who had sign-off on cover photos. 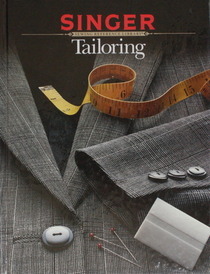 He insisted on a rayon/polyester challis for a suit jacket for the tailoring book. The plaid was lovely and more interesting than a solid wool flannel. But he couldn’t ‘see’ the garment until he had the actual garment under a lens. Those of us in the Sample Room were astounded as we knew exactly how a specific fabric design would look without making the garment. Multiple jacket fronts were made up for book cover mock-ups. The Sample Room did eventually produce a tailored jacket of the challis with much underlining/interfacing and tearing of hair. Pressing was a nightmare as shaping polyester is impossible, but with creative photo cropping, the poly plaid won the cover. You too, can be/become a Sewing Hacker. To some extent, visualizing skills–or the tendency–are inherited. The rest is learned. May I suggest a Fabric Know How class by Sandra Betzina. Sample, Sample, Sample as Practice makes Perfect–a Perfect Hacker! Tell me about your pattern/fabric hacks. Can This Fabric be Saved? This entry was posted in FIBER FASHION FUN. Bookmark the permalink. What an interesting post – the idea that visualisation of garments is not something everyone can do. I do a lot of hacking but generally I go off piste fairly quickly if off the shelf designs don’t give me what I want. I know, have always assumed visualization was a general ability. Most of my sewing friends visualize but then we also play/experiment with what we have. The lace cover-up looks nothing like the RTW triple digit inspiration. The fabric led me to the final product.